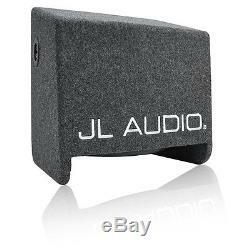 JL AUDIO CP110-W0v3 Sub 10 Box 10W0v3 Loaded Ported Enclosure w/ Gray Carpet. 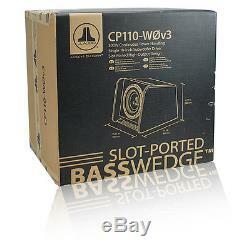 10 Single 4 Ohm W0v3 Series Subwoofer. Mineral-filled, polypropylene cone woofer for excellent durability. Large roll surround for generous amounts of excursion. Elevated frame cooling brings air directly to the voice coil. 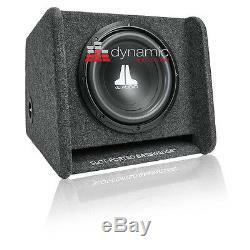 Designed for compact sealed enclosures or medium-sized ported enclosures. Lead wire woven into spider for added strength. 2 High temperature voice coil. 10 Slot Ported MDF Subwoofer Enclosure. 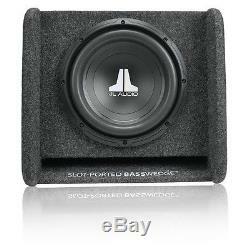 Loaded with single 10W0v3 10 subwoofer. Designed for forward, rear or down-firing installation. 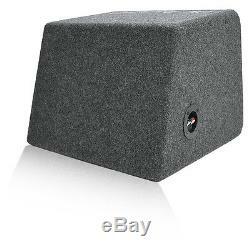 One (1) JL AUDIO CP110-W0v3 Single 10 10W0v3-4 Loaded Ported Enclosure with Gray Carpet Finish. Since founded in 2001, customers have always been at the core of everything we do. Our enthusiastic audiophile staff are here to create the best sound systems that work for you and your needs. Expedited Services are also available. Acceptance of Contract Terms The following forms a legal agreement between you and Dynamic Autosound Inc. This permission terminates automatically if you breach any of these terms or conditions or upon the request of Dynamic Autosound. Upon termination you must immediately destroy any downloaded and printed materials. You also can not "mirror" any material contained on this site. Trademarks The trademarks, service marks and logos (the "Trademarks") used and displayed on this site are registered and unregistered Trademarks of Dynamic Autosound and others. Dynamic Autosound enforces its intellectual property rights to the fullest extent of the law. Dynamic Autosound prohibits use of the Dynamic Autosound logo as a "hot" link to the Dynamic Autosound site unless establishment of such a link is approved in advance by Dynamic Autosound in writing. DYNAMIC AUTOSOUND DOES NOT WARRANT OR MAKE ANY REPRESENTATIONS REGARDING THE USE, VALIDITY, ACCURACY, OR RELIABILITY OF, OR THE RESULTS OF THE USE OF, OR OTHERWISE RESPECTING, THE MATERIALS OR PRODUCTS ON THIS SITE OR ANY SITES LINKED TO THIS SITE. Limitation of Liability UNDER NO CIRCUMSTANCES, INCLUDING, BUT NOT LIMITED TO, NEGLIGENCE, SHALL DYNAMIC AUTOSOUND BE LIABLE FOR ANY DIRECT, INDIRECT, SPECIAL, INCIDENTAL OR CONSEQUENTIAL DAMAGES, INCLUDING, BUT NOT LIMITED TO, HARM TO EQUIPMENT AND/OR PERSONAL INJURY OR DEATH, ARISING OUT OF THE USE, OR THE INABILITY TO USE, THE MATERIALS ON THIS SITE, EVEN IF DYNAMIC AUTOSOUND OR A DYNAMIC AUTOSOUND AUTHORIZED REPRESENTATIVE HAS BEEN ADVISED OF THE POSSIBILITY OF SUCH DAMAGES. IF YOUR USE OF MATERIALS FROM THIS SITE RESULT IN THE NEED FOR SERVICING, REPAIR OR CORRECTION OF ANY ITEM YOU ASSUME ANY COST THEREOF. SOME STATES DO NOT ALLOW THE EXCLUSION OR LIMITATION OF INCIDENTAL OR CONSEQUENTIAL DAMAGES, SO THE ABOVE LIMITATION OR EXCLUSION MAY NOT APPLY TO YOU. Typographical Errors In the event a product is listed at an incorrect price due to a typographical error, entry error or error in pricing information received from our suppliers, Dynamic Autosound shall have the right to refuse or cancel any orders placed for said product(s). Order Acceptance Policy Your receipt of an electronic or other form of order confirmation does not signify our acceptance of your order, nor does it constitute confirmation of our offer to sell. Dynamic Autosound reserves the right at any time after receipt of your order to accept or decline your order for any reason. This associated cost is non-refundable. Items improperly installed are not considered defective. Abused items are not considered defective. This listing is currently undergoing maintenance, we apologise for any inconvenience caused. 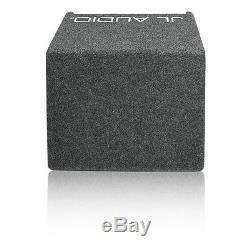 The item "JL AUDIO CP110-W0v3 Sub 10 Box 10W0v3 Loaded Ported Enclosure with Gray Carpet" is in sale since Friday, May 26, 2017.